The rich scent of crackling timber fills the air, fragrant and evocative on a damp autumn day. Soft light illuminates the intricate carvings of a 15th century mantle and burnished dogs. Looking across the room, one’s eye falls upon a carved marble vintage fireplace; delicately wrought antique mirrors reflect the light of the fire, bathing the room in a golden haze. 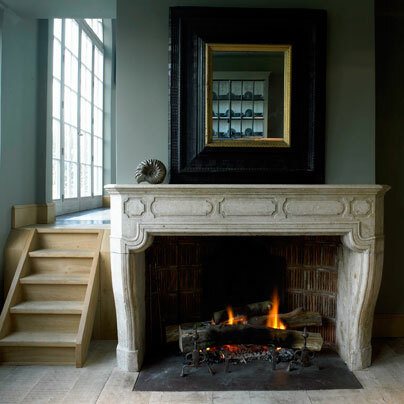 Welcome to the showroom and warehouse of Maison Leon Van den Bogaert, the leading European dealer in fine European original antique fireplace mantels, architectural elements and objects d’art. 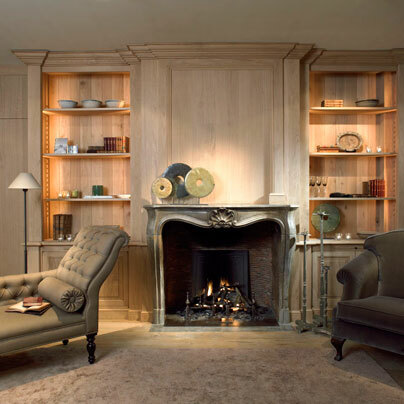 Founded fifty years ago by Monsieur Leon Van den Bogaert, this family business, nestled in the Antwerp countryside, is home to the world’s largest collection of antique mantelpieces. With over three thousand antique fireplace mantels in-house, the collection ranges from the 14th century to the mid-war 20th century period; it is a veritable treasure-trove of mantels from chateaus, manor houses, castles and landmark buildings across France and Western Europe. Many of these pieces are museum-quality and would be at home the world’s leading collections of decorative arts. Walking through the Van den Bogaert Leon showroom and their vast warehouse is to move into a time past. In each corner, the eye is delighted and surprised. Here is a delicate Louis XV marble mantel in a deep Burgundian red; there is an austere yet grand stone mantel from the 14th century; here is a dove grey marble mantel of the 17th century with hunting emblems wrought into the stone. Each mantel is an unique piece of work with its own tale. The history and story of each can often be gleaned by the elegant carvings and provenance of the smooth marble stone. Some bear regal coats of arms, others symbols of industry representing rich merchant families and some illustrate the original owners fancy be it hunting, horses, hounds or music. One can spend hours wandering through the warehouse looking at these mantels. The mind wanders as one’s hand glides across the cool polished stone surfaces: Did Cardinal Richelieu warm his hands before this mantel? Perhaps Marie-Antoinette and her ladies-in-waiting stood before another? Alongside the mantels, lies a remarkable selection of exquisite fire-backplates and dogs. The backplates often bear detailed carvings of gallant knights, lords on horseback following their hounds, distinguished family crests and rich religious iconography. Polished and gleaming in the firelight, these magnificent antique treasures are a sumptuous accompaniment to the mantels. While wandering through the warehouse, one must not ignore the dogs - simply elegant or exquisitely rendered Renaissance masterpieces, these brass and silver mounts complete the fireplace and its backplate. The dogs are a joy to examine. The carved ones bear faces of court jesters, hounds, horses and sometimes even mythological figures from Griffons to Greco-Roman gods. The simply wrought ones are impressive in their elegant and noble bearing - simple shapes delicately hammered into works of art. Amongst this vast collection of treasures, lies other delights. One finds wonderful marble columns akin to the ancient ones in Palmyra and Athens as well as carved colorful marble urns and basins with glistening and richly veined surfaces. There are elegantly wrought metalworks for baths and basins in the shape of leaping dolphins and creatures of the sea. There is a vast collection of antique terra-cotta and marble flooring waiting to be polished and installed. The selection of objets d’art and architectural elements is seemingly endless. What distinguishes Maison Leon Van den Bogaert from a museum is that everything is for sale. Whether your interiors are contemporary or classic, there are mantels and architectural elements to fit and enhance your rooms. In the following pages, one can see realizations of the mantels in an array of different homes across the world. We invite you to explore and enjoy. 10:00 and 5:00 p.m.. Weekdays by appointment..